And we're totally loving it. Drag races can always be entertaining, all the more so when the vehicular participants are totally mismatched. And that’s the drag race Top Gear recently decided to stage: a stock Ford Fiesta ST against a Bowler Defender, which is essentially a hot rod Land Rover Defender with four-wheel-drive and a supercharged Jaguar F-Type V6 with around 400 hp. The Fiesta ST? 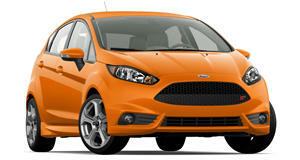 Front-wheel-drive, turbocharged four-cylinder with 180 hp. The ST’s official 0-62 mph time has already been clocked at 6.9 seconds. The Bowler Defender? Well, that’s unknown until post-drag race. Now, many of you will automatically think a drag race like this one is completely, totally useless. Really, what’s the point? These two vehicles have absolutely nothing in common, other than they both have gasoline engines and four wheels. Thing is, we actually dig unusual drag races because they offer a greater chance for a surprise finale. Doesn’t always happen, but we surely like the possibility. On the other hand, we’re guessing the Top Gear guys didn’t have much else to do on a recent and cloudy, rainy afternoon. So which of these two contenders will win this drag race? Honestly, you likely won’t be too surprised. The little hot-hatch will be a big miss stateside.